ISLAMABAD, April 8 (APP): President Mamnoon Hussain Saturday called for establishing an international group, comprising of Ulema and religious scholars who should present true picture of Islam in order to arrest the trend of extremism and try to bring the misled, back to normal life. The President was talking to Imam-e-Ka’aba Al-Sheikh Saleh Mohammad Bin Talib who called on him at the Aiwan-e- Sadr, according to a press release. He called for making concerted efforts to remove misperception about Islam, adding Muslim Ummah should stand united in defeating terrorism and extremist mindset. The President said Pakistan was committed to protect the sanctity of the Two Holy Mosques and any aggression against Saudi Arabia would be considered an aggression against Pakistan. He said the people and the Government of Pakistan have the greatest regard for Saudi Arabia. The President said the relations between the two brotherly countries were embedded in strong bonds of friendship, religion, fraternity, shared history and cultural ties. 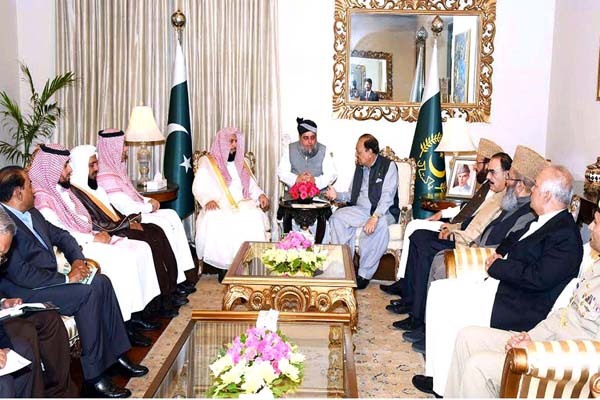 He noted that Saudi Arabia has always supported Pakistan on all important issues at the regional and international forums including Kashmir dispute. He expressed his gratitude that Saudi Arabia stood by Pakistan in every difficult hour and rendered assistance during natural calamities which was greatly valued by the people of Pakistan. The President thanked Saudi Arabia on restoring 20% Hajj quota for Pakistan and lauded the Kingdom for making excellent arrangements for Hajj and Umrah every year. He called for establishing a consultative platform of experts in social sciences to deliberate on a strategy to safeguard the Muslim world from alien cultural invasion. The President stressed that a system should be devised for rehabilitation and assistance of the people of Islamic world affected by wars and terrorism. He said the recommendations should be formulated to harmonize the educational curriculum of religious educational institutions with modern requirements so that the Muslim Ummah could excel in the comity of nations. Speaking on the occasion, Imam-e-Ka’aba Al-Sheikh Saleh Mohammad Bin Talib said the deep-rooted relations between the two brotherly countries were based on strong foundations. He said that he regards Pakistan as his own home and expressed gratitude for the warm love accorded to him during his visit. He said the enemies of Saudi Arabia and Pakistan did not want to see stability and development in the two countries and expressed confidence that both brotherly countries would defeat the scourge of terrorism together. Islam rejects all forms of violence and extremism, he said and called for forging unity in the ranks to collectively face all the challenges to Muslim Ummah. He also invited President Mamnoon Hussain to visit Saudi Arabia at his earliest convenience. During the meeting, Imam-e-Ka’aba also offered special prayers for the unity, harmony, stability, progress and prosperity of Muslim Ummah. The President also extended his best wishes for King Salman bin Abdulaziz and the people of Saudi Arabia on behalf of the people and Government of Pakistan. Minister for Religious Affairs and Interfaith Harmony Sardar Muhammad Yousuf, Senator Muhammad Talha Mahmood, member National Assembly Hafiz Abdul Karim and senior officials were also present on the occasion.